Moucharafu was talking to Brila FM’s Babafemi Raji in an exclusive interview for which I commend the “Topmost Striker” as Raji calls himself by the way. The interview was a great piece of journalism and this was attested to by the speed at which it went viral on the internet and on social media. A couple of weeks back in this column, I wrote about Pinnick’s CAF aspirations and suggested that Nigerians shouldn’t be too bothered if he won or lost because these CAF positions are of primary benefit only to the individuals holding them rather than their countries of origin. Moucharafu Anjorin is the latest “parasite” to validate my theory. For crying out loud, someone should tell or show me what Benin Republic has benefitted from Moucharafu’s membership of the CAF executive committee in the last four years that he’s been there. The last time I checked, tiny Benin had never made any remarkable impression on African football and neither CAF nor FIFA had given them any special grant to develop football in that country by virtue of Moucharafu’s personal influence. What they have got are just the statutory interventions accruing to all member countries whether or not they were represented on the executive committee. Therefore, I stand by my theory (until I’m shown something different) that all the hue and cry about CAF and FIFA membership are for personal aggrandizement rather than national advancement. Just as Moucharafu’s presence in CAF has not lifted Benin football from the doldrums, let no one try to fool me that Pinnick’s aspiration is a “Nigerian Project” that will facilitate our winning the FIFA World Cup. No, it will not! Having said that, however, I find Moucharafu’s arrogance in describing Pinnick as “my small boy” detestable. He was correct to call Pinnick a new comer in CAF politics having only served two years as president of the NFF. But the best man for a job is not necessarily the oldest or longest serving. The best man for a job is the man with the best ideas. …But, Can He Do It? Moucharafu is relying on his closeness to CAF president Issa Hayatou to retain his seat. Four years ago in Morocco when he defeated former Nigeria FA boss Aminu Maigari for the same seat, Moucharafu was assisted a great deal by the Hayatou camp. At that time, Nigeria’s Dr. Amos Adamu was serving a 3-year suspension from the FIFA and CAF executive committee after he was implicated in a sting operation by the Sunday Times of London to expose corruption in FIFA. Maigari (and Alhaji Ibrahim Galadima before him) had wanted to replace Adamu at CAF. But Adamu, who belongs to Hayatou’s camp was alleged to have blocked both Nigerians from succeeding him and instead anointed Moucharafu. 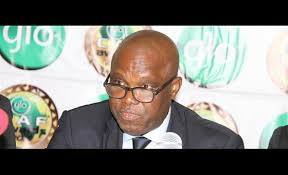 The Benin FA boss hopes that the Hayatou–Adamu connection will play out in his favour yet again. Infantino both of whom have visited Nigeria in recent months on Pinnick’s invitation. 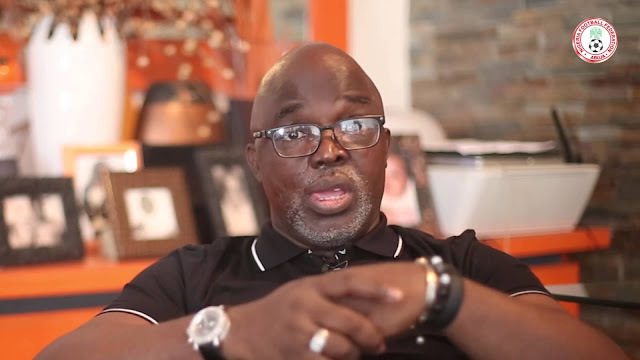 Pinnick was also recently appointed into the FIFA Organizing Committee on a 4-year tenure while Chris Giwaa who had been contesting the NFF leadership with Pinnick was banned by FIFA for five years from all football-related activities. If Samoura and Infantino pull their weight behind Pinnick successfully, Moucharafu will be in trouble. However, the Hayatou situation could also be decisive. The long-serving CAF President himself is being challenged for his own office by Madagascar FA president, Ahman Ahmad. The grapevine suggests that Infantino prefers Ahmad as the new FIFA boss looks to clear out the old brigade in the Confederations and in FIFA to make way for a new breed. But Hayatou is so well entrenched in CAF that he may have become immovable. To his credit, the Camerounian came out unscathed throughout the FIFA investigations that consumed former president Sepp Blatter, Michel Platini and a host of heavyweights in world football. In fact, Hayatou served for several months as interim president following Blatter’s removal and he supervised the process that led to Infatino’s emergence as FIFA president. If Hayatou succeeds in rallying his troops together to defeat Ahmad, Moucharafu will benefit from the bandwagon effect to also defeat Pinnick. From where I stand, I want Pinnick to come out victorious in this personal battle with the mouthy Moucharafu. But if he loses, it’s not necessarily a disaster for Nigeria. 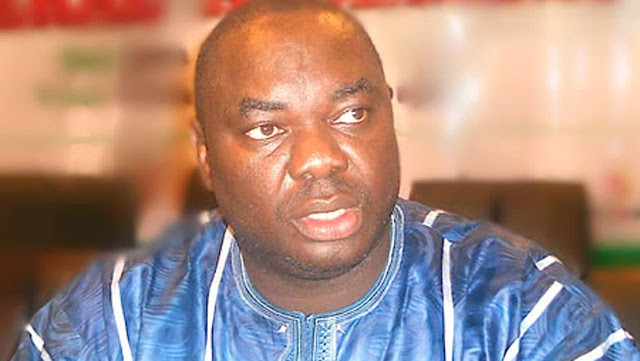 For Chris Giwa, It’s All Over! AT LAST, self-acclaimed factional chairman of the NFF has reached the end of the road in his inglorious journey to derail the administration of Nigerian football. Coming soon after the five-year worldwide ban clamped on him and his co-travelers by FIFA, the Nigerian Supreme Court on Monday this week threw out his case as well. Sometime in 2015 at the height of Giwa’s rebellion, I advised him in this column to sheath his sword, spare Nigeria the pain of another ban being threatened by FIFA on account of his going to a civil court, and wait for the next election to stake his claim for the NFF leadership. The dog that will get lost does not listen to the hunter’s whistle, so Giwa continued on his path to perdition. Now, he can’t even contest when the term of the current NFF executive committee expires in 2018 unless he gets a reprieve from the same FIFA that he has continuously defied. Nigerian Clubs Pay The Penalty! • TWO Nigerian club sides, FC IfeanyiUbah and Wikki Tourists were knocked out in the first round of the CAF Confederations Cup over the weekend. Join Kunle Solaja at the Sports Village Square to read up how these clubs paid the penalty for not being able to convert their penalty kicks! Click on www.sportvillagesquare.com. It’s a masterpiece from Nigeria’s football encyclopedia. Enjoy.